Just last week, INRIX Traffic was updated to version 4.1 with quite a few striking improvements. The app does one thing but does it well; reports traffic information. It uses this traffic information to report ETAs for your trip. I have used the latest version a couple of times and found it to be very useful. The iOS version of the app is AppRadio compatible. "This update includes fixes based on the great feedback we have received. Thank you! - Fixed various localization and crashing issues"
With INRIX you can save locations on your device (like Work or Home addresses). With the free version of the app you can save only two places; Work and Home. For an in-app purchase of $24.99 you can add unlimited places and get access to hundreds of traffic cameras all over. This premium purchase is optional. The big improvement in version 4.1 is the first one on the list above. When you start the app while connected to the AppRadio, you are directly shown the Places page. There is no app launch alert. This is great and tells us one thing. It is possible that all the pop-up alerts that we've been complaining about can be done away with by individual app developers themselves. This may not be an AppRadio issue at all. App developers need to look into this to make the AppRadio experience streamlined, the way it is with this version of INRIX Traffic. Many users had complained about a "parking brake lockout" which has been fixed in 4.1. Also, the maps in the app can now be controlled using full touch commands. They work really well and the app seems very snappy. Sharing your ETA is a nice feature too. Now you send your arrival time to the party you're driving to via Email or SMS. The default text includes arrival time, the flow of traffic on your route, route information (the streets you'll be taking) and a link to the INRIX app. I like this feature. The only issue is if you don't have the premium version there are only two locations you can use. Paying $24.99 for the premium version may look like a lot of money but if you travel to more than two destinations frequently and like having traffic information because of time constraints it may be a useful purchase. INRIX gives you more than one route you can take to a particular place with color coded travel times. Trip planning becomes a lot easy with this app. There are a few other features that I haven't used. INRIX Scorecard is one of them. 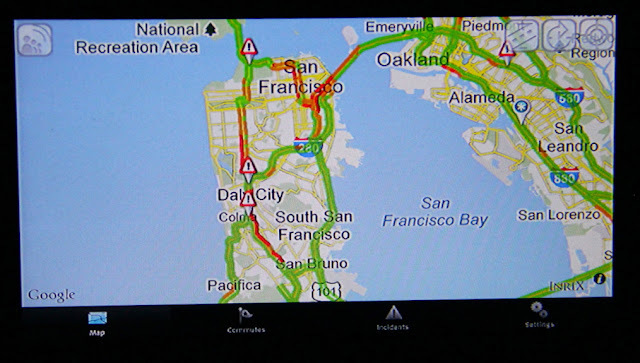 This gives you interactive graphical information about traffic in major cities. There is also a Top 10 member list you can view. Members get ranked based on the number of traffic incidents reported. Certain functions cannot be used while connected to the AppRadio. For example, I couldn't add an address from the AppRadio screen. This had to be done from the phone itself, while disconnected from the AppRadio. I haven't tried sharing arrival information from the AppRadio either. I'm guessing this is something that would have to be done from the phone itself too. The AppRadio interface of the app is very nice. I will upload AppRadio screenshots in a separate post. So stay tuned for that. Meanwhile, you can download the latest version of INRIX Traffic from the App Store and give it a try. Take a look and see if you will need the premium version. You may save some gas and time by using this traffic information. Sometimes the display is up-side-down. Based on how you hold your iPhone. I don't think it should do that. Is Inrix gone from Appradio? It isn't visible in the menu anymore.